Cure-Aid® dressing strip Lipo: Adhesive bandages for minor wounds, it could be cut to size. 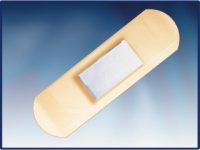 Lipo-Colloid dressings are absorbent non-adherent wound dressings. They are composed of gelling non-adherent Lipo-colloid wound contact layer, comprising polyester mesh impregnated with superabsorbent powder, soft paraffin and cohesion polymers. The Lipo-colloid wound contact layer is laminated to absorbent Non-woven fluff. Paraffinic components have non polar fatty nature, so they do not adhere with the polar protenaceous exudates. Hydrocolloid particles absorb exudates and turn to gel which provides optimum moist environment that enhances wound healing. Furthermore, it aids non adherence due to synergestic action between gel and paraffinic components. 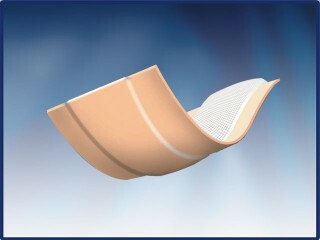 The polyester net allows the passage of exudates to be absorbed by the absorbent layer, so excess exudates do not have time to dry at the wound bed. Hydrocolloid particles gel upon absorption of wound exudates, creating moist environment in favour of wound healing. Due to its fatty, yet non-greasy, nature, together with the gel formation property upon exudates contact, Lipo-colloid dressings’s removal is painless and atraumatic for the wound. Being laminated to non-woven absorbent layer enables the dressing to manage different level of exudates. Exudates easily pass to absorbent layer through lipo-colloid mesh openings. The pad can keep the absorbed exudates even under compression; this prevents maceration and retains a humid surface environment to facilitate wound healing. The dressing is very soft and conformable, so it conforms to wound contours. Promote fast healing by stimulating fibroblasts proliferation. Used as primary dressings to cover minor wounds to absorb any exudates and provide moist environment in favour of healing process. Don’t use in case of sensitivity to any of the product ingredients. The product is sterile, don’t use if the pouch is damaged. The product is non-occlusive, so it could be used over infected wounds under medical supervision, and the dressing must be changed daily. The product must be stored flat, protected from heat, moisture and direct light.